Extract the contents of zip file. A service named "Sahi Pro License Server" will be registered and started. License server will run on port 8888 by default. To change the port, open spls/service/spls.ini change 8888 to the port you want. Type: Net Stop "Sahi Pro License Server"
Sahi Pro License Server can be accessed by navigating to http://localhost:8888/ on the same machine or by navigating to http://your_license_server_hostname:8888/ from other machines. One has to enter the valid password when accessing the web interface from other machine. User can logout from the session by clicking the logout button on home page of Sahi Pro License Server. Sahi Pro Licenses can be added and managed. To add license: Choose Files > Select a license file to add > Add License. Lists all licenses added. Expired and non-concurrent (user) licenses are shown striked out. Sahi Pro instances consume licenses but Sahi Pro Runner instances do not consume licenses (For auditing purposes only). info NOTE: Only Sahi Pro Concurrent Licenses will be honored by the Sahi Pro License Server. Lists all Sahi Pro sessions that procured licenses from Sahi Pro License Server. Revoke: It will release the issued license for that particular user. Sahi Pro instances consume licenses. Lists all Sahi Pro Runner sessions (For auditing purposes only). Sahi Pro Runner instances do not consume licenses. Sahi Pro Desktop Add-on instances consume licenses but Sahi Pro Runner Desktop Add-on instances do not consume licenses (For auditing purposes only). info NOTE: Only Sahi Pro Desktop Add-on Concurrent Licenses will be honored by the Sahi Pro License Server. Lists all Sahi Pro Desktop Add-on sessions that procured licenses from Sahi Pro License Server. Sahi Pro Desktop Add-on instances consume licenses. Lists all Sahi Pro Desktop Add-on Runner sessions (For auditing purposes only). Sahi Pro Desktop Add-on Runner instances do not consume licenses. This shows the Sahi Pro License Usage Reports in graphical and tabular format. Sahi Pro Usage List and Sahi Pro License Denied List can be downloaded as CSV format. 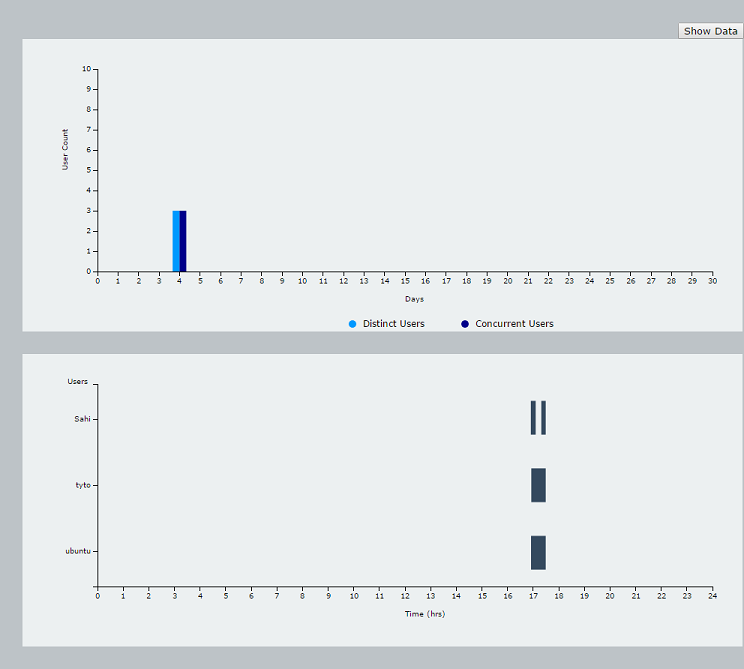 The Bottom graph shows the daily usage of license data as per the selected date (date can be selected from Date Picker or click on the Light/Dark blue colored bar shown in the above graph). Sahi Pro Usage List: This will show the list of Sahi Pro users who procured license from Sahi Pro License Server successfully. 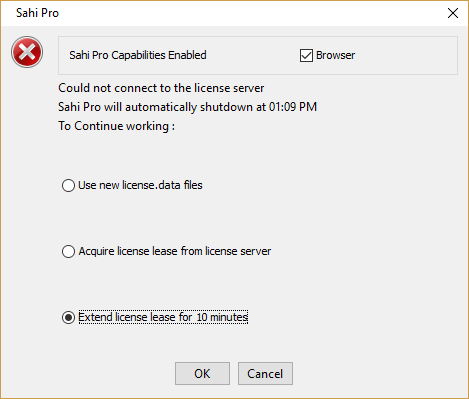 Sahi Pro License Denied List: This will show the list of Sahi Pro users who are unable to procure license from Sahi Pro License Server. 4001 - Could not obtain license. All licenses are issued. 4002 - User is not allowed to access license. 4003 - Time difference between the License Server and the System is more than the allowed time difference. Sahi Pro users who are added in the Access Control List can only access the Sahi Pro License Server and procure a license. Example1: If the Access Type is IP Address and Access Value is 192.168.1. * Then all the Sahi Pro users whose IP Address is between 192.168.1.1 to 192.168.1.255 can access Sahi Pro License Server and procure the license. Example2: If the Access Type is IP Address and Access Value is 192.168.1.? 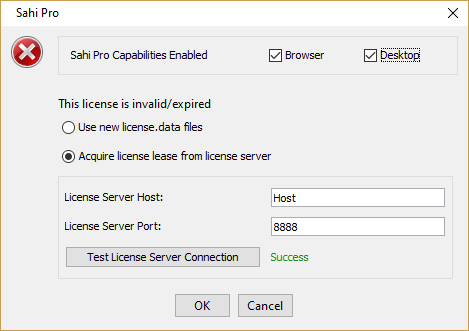 Then all the Sahi Pro users whose IP Address is between 192.168.1.1 to 192.168.1.9 can access Sahi Pro License Server and procure the license. When accessed from other machines, the Sahi Pro License Server will ask for a password. The default password is: password. After installation do change the password to prevent abuse. NOTE: In this release forgot password feature is not available when accessed from other machines. To modify License Server properties, open spls/userdata/config/server.properties file. If no license is present, you can manually upload the license.data file for Sahi Pro and license_desktop.data for Sahi Pro Desktop Add-on using the following GUI which will show up when starting Sahi. The checkboxes adjacent to Sahi Pro Capabilities Enabled shows the enabled sahi capabilities. Uncheck the checkbox to disable any of the sahi capability. Once the sahi capability is disabled, there is no need to add license for the same. info Now there is no need to add Sahi Pro license license.data for the automation of Desktop applications only. Just add Sahi Pro Desktop Add-on license license_desktop.data. One needs to add licenses based on Sahi capabilities enabled. 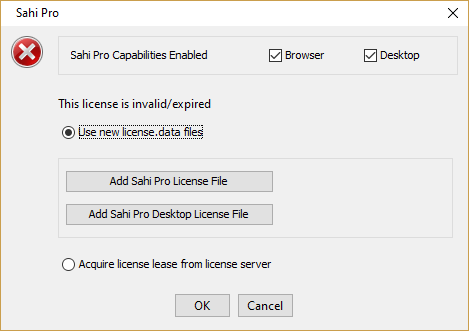 If no license is provided to Sahi Pro/Sahi Pro Desktop Add-on or the license provided is invalid/expired, the following GUI will show up when starting Sahi. Select the option "Acquire license lease from license server". 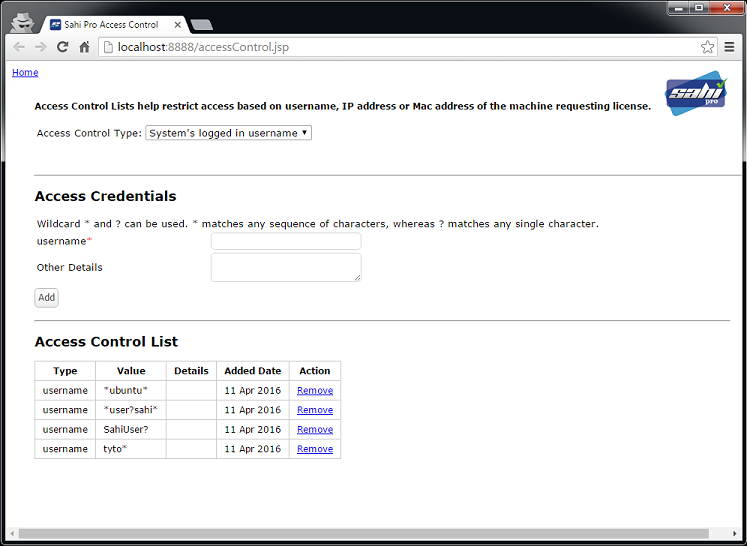 Write in the License Server Host and Port number in the textboxes. Test the Host and Port number by pressing the "Test License Server Connection" button. Once configured, you can save these settings by pressing the "OK" button. #The hostname or ip address of the machine on which license server is running. #The port number on which license server is running. Default port number is 8888. NOTE: If the Sahi Pro License Server is down or not accessible, Sahi Pro will run for 30 minutes with prompts like this appearing every 10 minutes. By default Sahi Pro License Server stores its reports in a H2 database. Sahi Pro License Server also supports MySQL, MSSQL and Oracle databses to store the reports. Take a backup of existing Sahi Pro License Server spls/userdata folder. Download latest Sahi pro License Server Sahi's download archives and extract contents of zip file. Take a backup of new Sahi Pro License Server spls/userdata folder. If you are using different database other than H2 database, then make sure you copied corresponding jdbc jar files to spls/extlib folder. 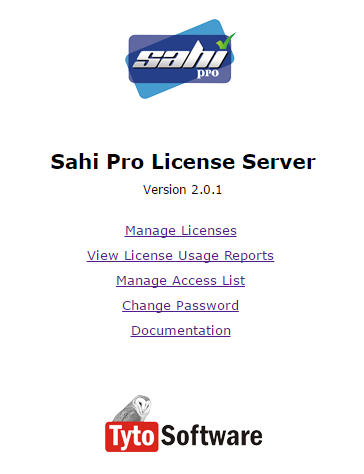 Restart the Sahi Pro License Server and verify the data.